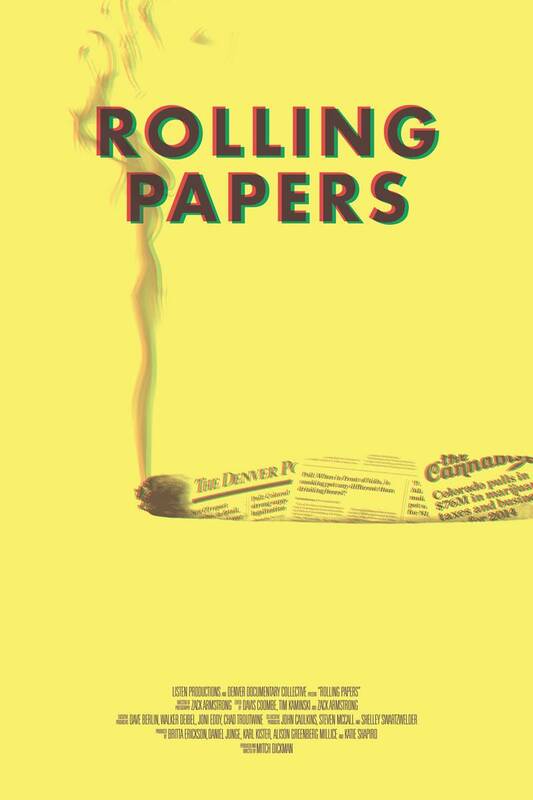 “Rolling Papers” provides an interesting glimpse into Ricardo Baca’s role as “the nation’s first marijuana editor,” and the inner workings of a salaried cannabis journalist under the thumb of a major newspaper conglomerate. While the first year of Colorado’s legal cannabis market made its fair share of headlines in 2014, the feature length documentary film “Rolling Papers” digs in from behind the ink over at The Denver Post, to chronicle the appointment of the nation’s first mainstream marijuana editor, Ricardo Baca. The movie follows him as he embarks on a ferocious mission to tell the tale of a state that has severed ties with decades of cannabis prohibition. The film begins its journey of unveiling the world of marijuana journalism by introducing the casual fashion of Baca and several members of his staff, including John Ingold and Eric Gorski – a couple of relatively straight-laced reporters charged with maintaining some level of truth and integrity within Colorado’s newfound cannabis market. Together – armed with two pot critics, whose primary responsibilities are to smoke copious amounts of cannabis and write about their experiences for the Post’s marijuana-themed website The Cannabist – the team leaps into a journalistic expedition of the state’s legal cannabis culture that, at times, appears to be a last-ditch effort to save Colorado’s largest print newspaper from becoming yet another casualty to the digital age. The filmmaker has a flair for capturing the contempt brimming in the faces of fellow “Denver Post” reporters during staff editorial meetings. In one scene, editor Gregory Moore speculates that many of the state’s churchgoers might set out to get stoned before participating in Easter services, which does not spark much enthusiasm from around the room. In fact, it’s interesting to see that, with the exception of Baca and Moore, there really doesn’t seem to be that much fervor at the idea of the newspaper being the first in the country to designate a cannabis beat. The true salvation of “Rolling Papers” is the likability of Ricardo Baca and his ability to go out and get the job done without coming across as one of those editors who grinds the corporate axe without concern for the corpses rotting beneath him. From his laid back, friendly demeanor right down to the respect he gives the subjects of his interviews, the film truly captures an extremely abbreviated year with an editor that most people working in this business wouldn’t mind punching a clock for. Yet, some of the crooks and con men of Colorado’s cannabis industry may not share in that sentiment. A classic part of the film is watching Baca shake the foundation of Colorado’s edibles market by launching a full-scale investigation into Dr. J’s, a company that had its products ripped from dispensary shelves in 2014 – just three months into legal sales – due to hundreds of complaints over their ineffectiveness. Ultimately, Baca nails the company to the wall after it’s revealed through a series of laboratory tests that the edibles, which claimed to contain 100mg of THC, had almost untraceable amounts of the psychoactive compound present within. At times, the focus of the story moves away from Baca and onto the other, less interesting staff members, as if to provide a level of contrast that simply isn’t necessary. In spite of some of the more unforgiving moments throughout the hour and 20 minute production, it’s a relatively solid film about journalism. It is difficult to say, however, whether “Rolling Papers” will be greeted with widespread appeal or if the audiences will simply start and stop with pot writers and other reporters across the globe interested in how their peers are covering the hot topic of legal marijuana. Whatever the outcome, the film is absolutely destined to become a well-respected relic of the time. What are your favorite films about cannabis? Considering the fact that marijuana has been known to stop the growth of cancer cells, I would not be surprised if it aided in treating skin cancer. Thanks for sharing. I think that’s the only serious movie about this thematic. Many documentaries already explore the industry, but Rolling Papers is quite an UFO. Do we know why did they decide to take a Wiz Khalifa song as the title of the movie ?